One Day More Fitness Blog: 200 Days Low Carb/Keto with One Cheat Day! - Long With Lots of Numbers! 200 Days Low Carb/Keto with One Cheat Day! - Long With Lots of Numbers! Wow! 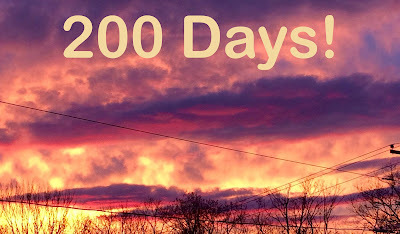 So today I hit 200 days of low carb/keto with one cheat day (yesterday no less). First off, I still feel great from the cheat day. I had no carb/sugar hangover when I woke up and I'm right back on the low carb track today! So, back to the 200 days! I am impressed but not surprised that I got to this place. Once I had my 100 days down, I knew I could keep going for another hundred and that one cheat day was very planned out and definitely enough to keep me satisfied for many more months to come! Also, today starts my new 30-day count for my next funny sports tank top. My biggest goals for next 100 days are to keep working toward my final goal weight, to get back on track with regular exercise and to stick with the no cheating plan! I can't wait to see what next 100 days bring!